I am a HUGE lip balm fan. I love anything that adds a bit of shine or a touch of neutral color. My style is not in-your-face, bold and outrageous, but rather quiet, subtle and neutral. Favorite lip colors are blushy rose, cafe' au lait and clear. This time of the year the wind is quite unforgiving and I find my lips are getting drier. With the dryness of the air, it is time to once again break out the lip moisturizers and I have some of my all-time favorites from which I can choose. One of my favorite lip and skin care companies is Carmex and currently, theirs is the brand I am using. 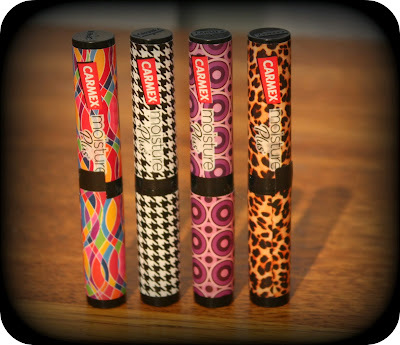 Founded by Alfred Woelbing - the inventor of Carmex® Lip Balm – Carma Laboratories Inc. is a family owned and operated business that employs more than 100 people in Franklin, Wis. Carma Laboratories makes Carmex brand lip balms, including a premium lip balm called Carmex Moisture Plus™ ultra hydrating lip balm, and Carmex skin care products. Carmex is available in major drug, food and mass merchant retailers, at convenience stores throughout the United States, online and in more than 35 countries around the world. I have been a Carmex fan for some time now and have a hard time deciding which I like better, the lip moisturizer or the lotion. Right now, I am using the lotion multiple times a day because it absorbs quickly, isn't greasy and works extremely well for me. I was thrilled when I heard about the Limited Edition Moisture Plus Collection and could not wait to try it out! 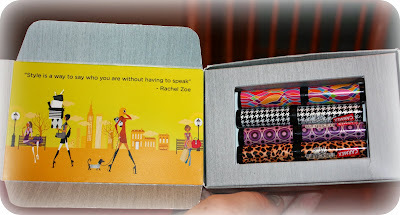 So, for this review I was sent all four lip moisturizers from this collection: Whimsical (multi-colored), Fab (purple), Chic (black and white) and Adventurous (leopard print). My package arrived in this cute little box the other day and it was all I could do to NOT get into it right then and there! I have to say that I just LOVE the bright and stylish colors. There truly is a style for everyone! Each stick is slimline and will fit nicely into any pocket, purse, glove box, wallet and diaper bag. As always, the Moisture Plus formula is amazing. To me, it has a slight orange flavor and is very silky smooth. 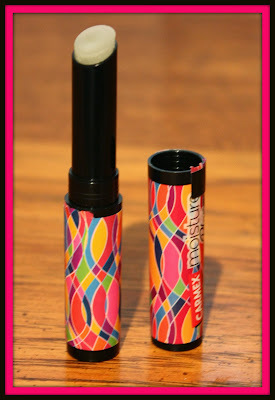 When I apply it to my lips, my lips stay moist for hours...which is one factor I consider what lip balms I want to use. When you are trying to decide which "personality" you are, Carmex has developed a really neat quiz to help you determine which style fits you best. This Uniquely You Personality Quiz is super easy to take and I found out that I am the "Chic" (black and white) style...which is pretty accurate! My sticks also came with neat little cards that explain each lip moisturizer's style and I thought this was a cute touch. 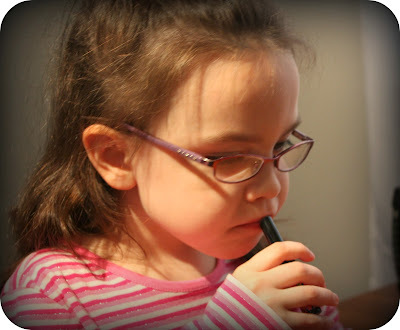 My lip balm sampler was on hand for this review and so I let her pick out the one she liked the best and give it a try. She picked Whimsical because she loved all the bright colors...that IS her personality too...wild and crazy. :) She loved it and it ended up helping her lips feel a bit better. She has been chapped and this helped to give her just a bit more moisture. 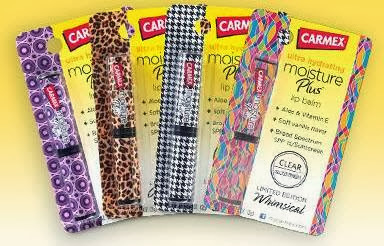 So, if you are looking for some great stocking stuffers or small gift ideas, be sure to check out the Carmex Limited Edition Moisture Plus Collection. It is chic, trendy, stylish and PERFECT for any gal on your list this holiday season! You can find this collection at mass retailers and drug stores across the country. Disclaimer: I received no monetary compensation for this post. As a member of the Carmex Blog Squad I did receive Carmex products for review purposes. 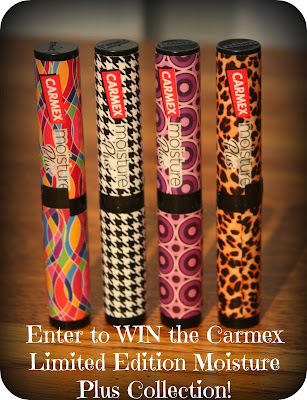 All quotes and stock photos are from the Carmex website and email. Prize is being provided and shipped by the sponsor. This blog is not responsible for lost, stolen or damaged prizes. All thoughts and opinions are 100% mine. You’re a classic, refined beauty with sophisticated taste. My result was Chic- which was perfect because it was also the disign I was most drawn to! 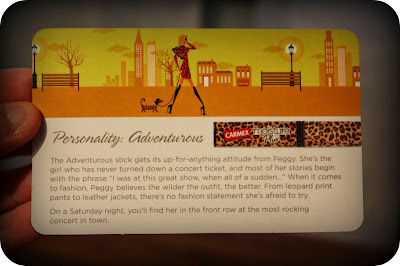 Apparently I'm an adventurous Rocker Chick. Who knew, lol? I did quiz and I am Whimsical. I took the quiz. Said I was Fab. I got Whimisical in the quiz. Thanks for the opportunity to win. I'm chic! and I loved the design! Mine came up with chic! which is exactly the one I would have chosen without taking the quiz! I seem to be falling in with everyone else lol"
You’re a natural beauty with an easy, low-key look. "